Understanding Flipped Coordinate Systems was posted on February 2nd, 2009 at 12.25pm and is filed under Cocoa, Downloads, OS X, Programming, Quartz. This entry has 7 comments. You can follow any responses through the RSS 2.0 Feed. Flipped coordinate systems always seem to confuse people, myself included. After working things out with pen and paper or handpuppets, I always feel like they’re not quite correct so I thought I’d resolve things here. If anything, I can refer back to it whenever I forget this stuff (which happens every couple years). First a refresher in case you need it: Cocoa Drawing Guide: Flipped Coordinate Systems. CTM. While setting something as flipped will flip the CTM, modifying the CTM without setting the graphics context as flipped results in everything being entirely upside-down, which is different. Many of the Cocoa classes and functions take flipped coordinate systems into account and will draw right-side-up for you but it gets tricky with images. The -composite... methods actually seem to work in the sense that the image is always right-side-up. The problem is that it draws “upward” from the draw point regardless of the coordinate system. The result is you have to calculate the compositing point at the upper left corner of the image instead of lower left. This is the result of these methods not taking the CTM into account in terms of scaling and rotation. That also means that if you scale your view up, the images won’t scale with it. While you can use this to your advantage in some cases (like rendering resize handles or labels which you want to stay the same size regardless of zoom), it’s usually not the right way to do it. View scaled at 2x. Notice how the composited version does not scale. The -draw... methods on the other hand follow the CTM properly. That also means that if the view is flipped, so is the image, so you need to adjust accordingly. So while these methods obey the CTM, they do not take into account the flipped flag of the context which would be the cue to draw things right-side-up. The draw... routines follow the CTM, but not the flipped flag. Now, to complicate things even further, NSImage’s themselves can be flipped. The reason for this isn’t to make the images upside-down. It’s there to provide a flipped coordinate system for whenever you draw into it (i.e. lockFocus on it, draw, then unlockFocus). 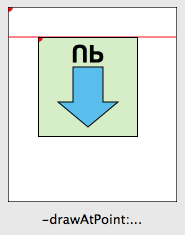 It’s useful for when you want to tell a flipped view to draw into an NSImage, for instance. It’s basically like a flipped view; you don’t expect a flipped view to draw upside down, no matter which view you set as its superview. A subtlety to be aware of is that flipping an image loaded from a bitmap does not make too much conceptual sense (you are changing the coordinate system after the content has already been “drawn”) but it does have the practical effect of flipping the image vertically, which seems to be an implementation detail. Yes, flipping the image will work to “correct” orientation problems in most cases but, depending on where your image gets its data (for instance if it has an NSCustomImageRep like the example app – see below) and whatever implementation-specific details lurk in NSImage, you may end up with undesired or inconsistent results. As mentioned above, I’ve put together a little interactive example app (Leopard-only) to show how the different methods behave. In addition, I’ve written methods in an NSImage category (-drawAdjusted...) which will render the image correctly regardless of the flipped status of the coordinate system it draws into. As suggested in Apple’s docs, it does a transform reversing the flip, draws the image, then reverts the coordinate system back. The image itself is drawn by code, not loaded from a bitmap. The reason for this is that I also wanted to illustrate using flipped images. It draws an arrow and some text to indicate the proper orientation. When flipped, the drawing code is exactly the same in that no coordinates are recalculated. The text content is changed to compensate for the new orientation. 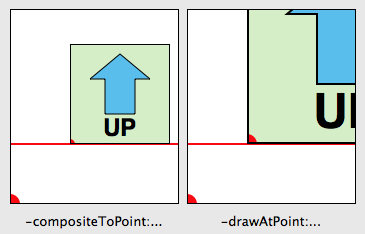 Notice how the text renders right side up no matter the flip state of the image; an indication that the NSString drawing methods are “flip-aware.” Also, it shows how to check the graphics context to get its flipped status so you can make your own drawing routines flip-aware as well. Unfortunately, not everyone draws flipped images correctly. One place in particular is NSView’s/NSWindow’s -dragImage:at:offset:event:pasteboard:source:slideBack: method which will draw flipped images upside-down. Since you can’t control how the image is drawn, you can instead draw your flipped image into another non-flipped image and pass that in. I’ve added a method to the NSImage category to do this and you can check out the result in the example app (you can drag the image out of the views though only the last one has the corrected version). And what if you actually want to draw everything upside-down, you irrepressible nut? Well, apply your own transforms using NSAffineTransform or CGAffineTransform. Just remember to concat the transform and not set it (a good general rule when using affine transforms). As long as you don’t tell any classes that you’re flipped, it should work out. Do not set images as flipped unless you know what you are doing. Use the -drawAdjusted... methods in my category (or similar technique) to do all your image drawing. If you didn’t listen to rule #1 and you have a flipped image and it is showing up upside-down even when following rule #2, then use the -unflippedImage method in my category to get an unflipped version of the image and use that instead. That should handle most cases you run into. And trust me on rule #4. – were you born in Sicily, or from Sicilian-born parents and lived there a substantial amount of your life? – if not, have you been in life-threatening situations involving any Sicilian person? – if neither, why the racist remark? I apologize if you misinterpreted it but it was just one of those inane rules of thumb that was used in the film (I don’t know if it was in the book itself). I could just have well mentioned “Never get involved in a land war in Asia”, though, that one, as noted, is slightly more well known :). Thanks for taking the time to write this up in such detail. Sicilians are a separate race now? Sheesh. Great stuff, really useful. I’ve been struggling with this. I was using [image setFlipped] but I shall try to resist. Going to try your example app now. Really showing your true colors there with the crack at Sicilians. @Gerardo – what color is that?